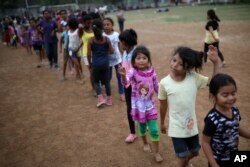 The Trump administration is pushing back against news reports that it has lost track of almost 1,500 immigrant children who came to the United States as unaccompanied minors. Children wait to receive gifts after a show to entertain them at the sports club where Central American migrants traveling with the annual Stations of the Cross caravan have been camped out in Matias Romero, Mexico, April 4, 2018. A Central American child who is traveling with a caravan of migrants sleeps at a shelter in Tijuana, Mexico, April 29, 2018.